Well, managed to get the last base bolt in using a large g clamp. Got the seat in the car, once again only 3 of 4 bolts line up, so fitted it & am just leaving it like that. The rail is stiff but does move, if I bend it enough to get the last hole in I don't think it will slide at all. Going to take a dremel to the mounting holes tomorrow and oval them out enough for a clean fit. Then going to start taking my drivers side a part, only did the passenger back bar today as a test fit. A nice little comparison shot between the VVT half leathers and the Recaros, Recaros definetly more beefy, and a lot more comfortable. I'm thinking about putting the VVT half leathers up for sale on here for anyone looking to update the rather cookie old 90s interiors. Only as the back and base though (as obviously I've used the rails & back bar). with regards to this most excellent thread..i have just bought a superb pair of recaros, which have come with original sport subframes, mounting s look identical, does this thread still apply..?? The ignis base is wider, so you will still need to follow this guide and swap bits around to get them in. Its not as hard as it sounds. Also worth swapping the driver and passenger seat bases around as usually the drivers has had more wear & tear, swapping them evens it out a bit. 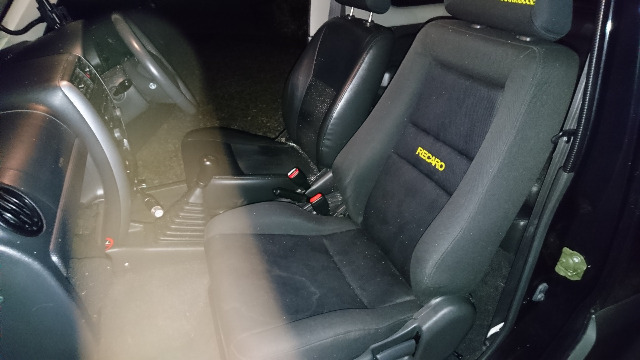 With the stock seats they recline back to level with the rear seat, do the Recaros do the same? If not could anyone with no rear seats snap a pic of them fully reclined for me please? Having just read this thread wouldn't it be simpler to use some suitable flat bar to move the Jimny runners in board of the recaro seat base holes half an inch each side or am I missing something? Yeah Lambert, the Jimny base doesn't bolt in flat, the side next to the centre console sits about 30mm higher than the side towards the door. I don't believe this is the case with the Ignis which bolts in flat. Don't get me wrong it could probably be done by butchering the Ignis frame slightly, and/or using spacers on your runner bars, but it'd be janky. Also there is not a massive amount of clearance in a Jimny seat base for it to be any wider. Its Just confusing me that the modification is to make part of the frame wider and then bolt it back into it's existing narrower mounting holes, seems to be a bit of a compromise for want of a better solution? Hi Lambert, i see where you are coming from, ive been looking at doing similar to how you think, will be fitting mine next week, and let you know how i get on..pics too hopefully. Hi Lambert, ive measured the two seat bases, and gap between runners, they are identical at approx 18inch..but bolt holes on Ignis seats are in different places, ie, front on outside, jimny inside, however..as you say, by cutting the rear bar, and extending it, you then actually buckle/bend the base runners inwards, thus people find it is stressed, , thus being tight to move, i am at this moment stripping rail sliders down on ignis, as the height etc, and fitment of seat points is virtually identical, not sure how they come apart, but, if i am right, i can the fit jimny lower rails onto ignis rail upper..and, possibly a couple of spacers they should fit fairly easily, and, more importantly not be tight, as they wont be buckled, also a bonus would be the front adjuster on recaros can be used...we shall see. As an addition, by the way, the jimny base has its mounts higher on the inside, nr trans tunnel, and, more importantly, so does the ignis sport, thus mounts are also canted in correct location, they (ignis) dont bolt in flat, they have approx, same hieght on mounts as jimny..
will keep you informed, pics too when i suss it. Thank you. If the guy who is supposed to be supplying mine ever gets back to me I will try this also.